Fender’s Fortis Series are a superb offering in the ever-important category of active speakers. They are affordable, lightweight, powerful and rich in features, and their introduction has inspired a series of PA packages that have the Fortis active speaker as their centerpiece. This package features the Fender Fortis F-12BT, a 1300-watt powered speaker with a 12” low frequency driver, a 1.75” titanium diaphragm compression driver and Bluetooth streaming capability. It also includes a Yamaha MG-10XU and an accessories package. Combining the power of streaming technology and versatile design with user-friendly features, the F-12BT is 1,300W of audio power packed into a lightweight package. With a wide variety of I/O connections, the three-channel F-12BT can handle almost any source you send to it, even offering high-quality stereo Bluetooth audio for wirelessly streaming music from any Bluetooth source. Channel One is dedicated to line-level signals while Channel Two accepts line- and mic-level signals. Channels One and Two are fed by discrete balanced XLR-1/4” TRS combo connectors while Channel Three offers stereo Bluetooth and 3.5mm auxiliary inputs. Powered by dual onboard Class ‘D’ amplifiers, the 1.75” titanium horn-loaded driver and 12” woofer work in tandem to create crystal-clear room-filling sound with a 40°x90° dispersion pattern. The MG10XU is the ten-channel mixer with four mono XLR and 1/4" hybrid inputs along with three stereo line inputs. It has a full complement of effects, three bands of EQ on the first four channels, with effects available on all channels. It supplies phantom power and has a low-noise, clear and present output. The MG10XU boasts an intuitive interface with capacities suitable for a diverse range of users and applications. The solid construction and flexible design of these consoles lets you shape your sound with confidence, continually delivering peak performance and a level of sound quality and reliability that has made it a leader in its class. 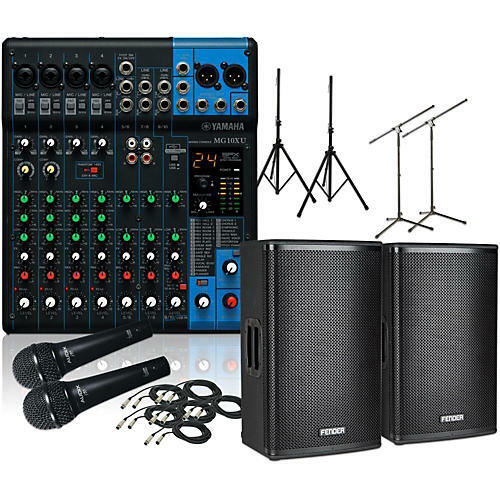 This PA package is complemented by a selection of well-built accessories that will make your stage setup easy. Two Audix FS5 cardioid dynamic microphones are included, as well a pair of Musician’s Gear tripod boom microphone stands. Your new Fortis PA speakers can sit safely and securely atop a pair of Musician’s Gear tripod speaker stands, and all of the cables you need to get set up are included as well, in this case, six 20’ XLR to XLR cables.